In examining the character of Maj. Glenn Talbot, who served under the command of General "Thunderbolt" Ross and who diligently carried out Ross's orders in his efforts to capture or otherwise contain the incredible Hulk, it seemed the Major had reached a turning point in his life when we last left him--both as an officer and as the husband of Betty Ross, the General's daughter. 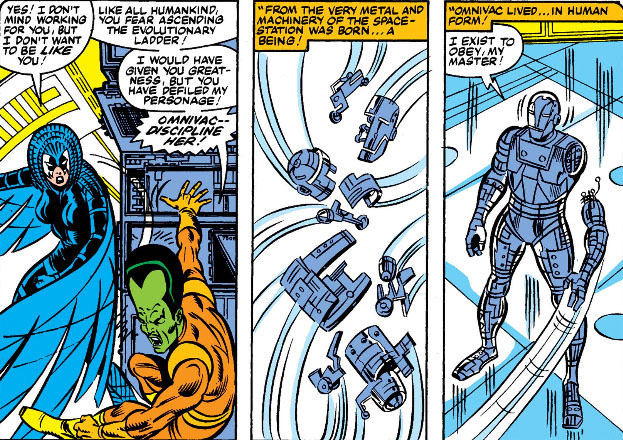 Talbot--thanks to the efforts of both Bruce Banner and the Hulk, of all people--had just had his mind restored from damage he had suffered while a captive of the Gremlin. But returning from the dead is no small matter; and, still suffering post-traumatic stress from his ordeal, Talbot must pick up the pieces of his life. 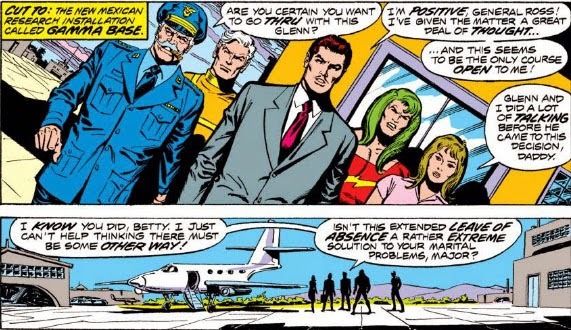 Yes, it's crystal clear what you're thinking: Unless Betty borrowed some growth solution from Hank Pym, that just has to be a wig she's primping. The Hulk, of course, isn't waiting around for these two to wind up in Hollywood pitching a reality show about themselves. ("Taking A Break With The Talbots!") Life must move forward for them--but for Major Talbot, the path forward will prove to be a bitter one, as he faces up to the fact that he may be beginning his own vendetta toward Banner and the Hulk. 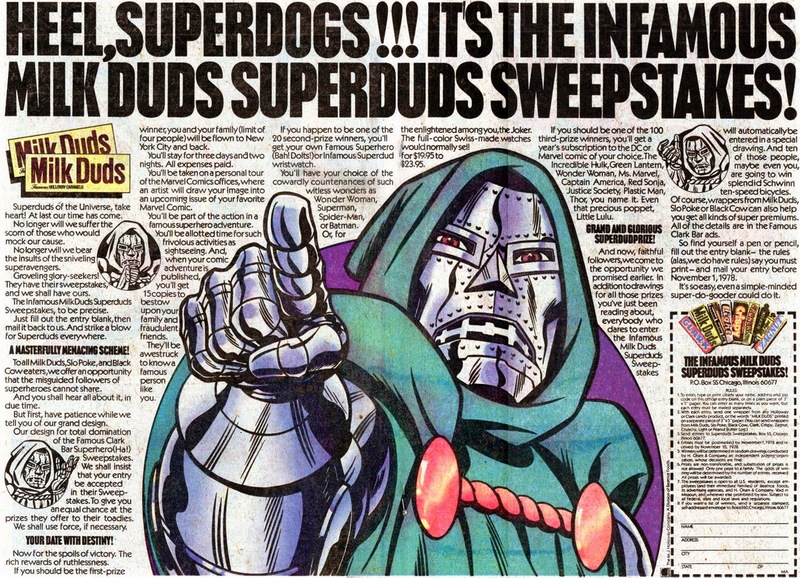 If you were reading comics in mid- to late-1978, you probably remember seeing a few double-page sweepstakes offers from Beatrice Foods, which at the time held candy products such as the Clark Bar, Milk Duds, Zagnut, et al. 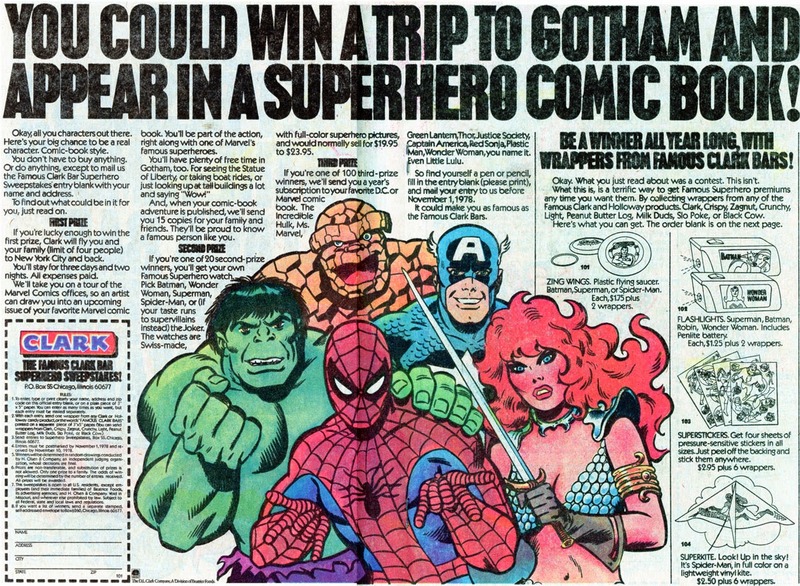 The ads were placed directly at the mid-point of the comic you were reading, and featured a large graphic of either one or a group of Marvel characters (I'm assuming DC comics also had ads with their own characters featured), surrounded by the terms of the sweepstakes. If you were like me, the last thing you wanted to do was to interrupt the story you were reading and machete your way through this kind of promotional material; so chances are you flipped the page, and by the time you'd finished the story, the sweepstakes ad had already been forgotten. Still, free money and prizes were being offered (legitimately, it seemed), and so I feel it's my duty to let you know what we passed on at the time. For what it's worth, we probably don't even remember what story we found so much more interesting than these ads--how's that for karma. With these ads, the devil indeed seems to be in the details. For instance, entry into the Milk Duds sweeps automatically entered you into the Clark Bar sweeps--but not vice versa (at least not according to the copy). Also, there was no Grand Prize in the Clark Bar sweeps, as there was in the Milk Duds ad. There are one or two other discrepancies between the two sweeps, but offhand I'd say the Milk Duds sweepstakes was the better choice. And speaking of contests, let's jump to 1980 and see what Marvel itself cooked up when it threw its hat into the contest ring. Remember when this banner appeared on comics covers at the time and effectively shrunk the cover's art to accommodate it? The "Win-Yourself-Some-Big-Bucks Contest" was a kinda-sorta sweepstakes--except that you had to work a little harder to enter, and prize recipients weren't determined by random drawings. Boiled down, it's a Marvel survey; but instead of checking off boxes, you give your answers in written form. 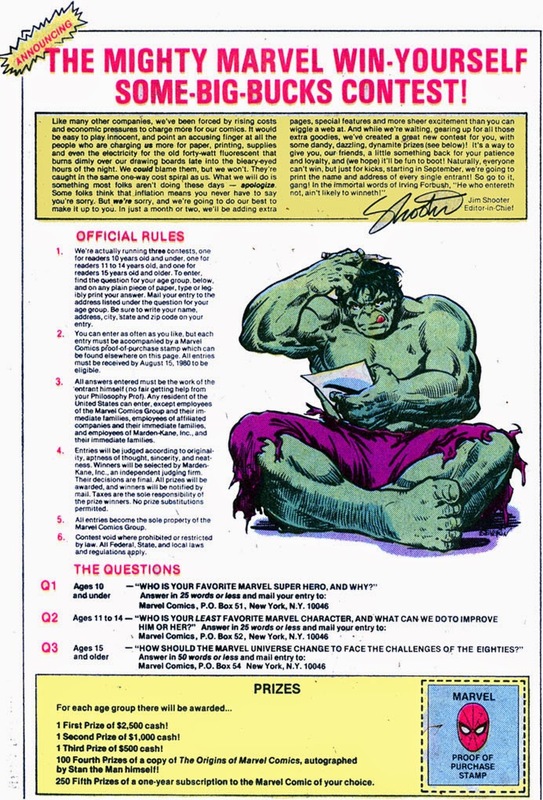 You could enter as often as you wish, but each entry must be accompanied by a proof-of-purchase stamp (i.e., you'd have to buy a comic each time you wanted to enter). The winners were selected by Marden-Kane, Inc., an independent judging firm, based on "originality, aptness of thought, sincerity, and neatness." Trustworthy. Loyal. Helpful. Obedient. Opinionated. 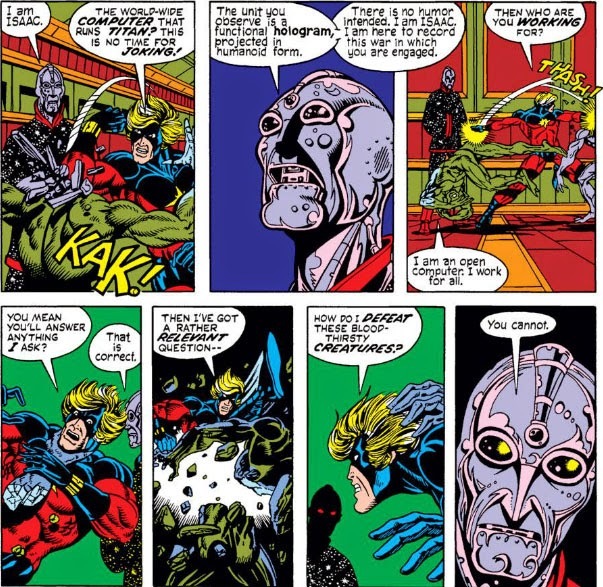 Given the temperament of Luther Manning, whose damaged body eventually became "Deathlok," the computer had to often insist (for lack of a better word) on a course of action while a mission was being carried out, which resulted in it and Manning taking an almost argumentative stance with each other. 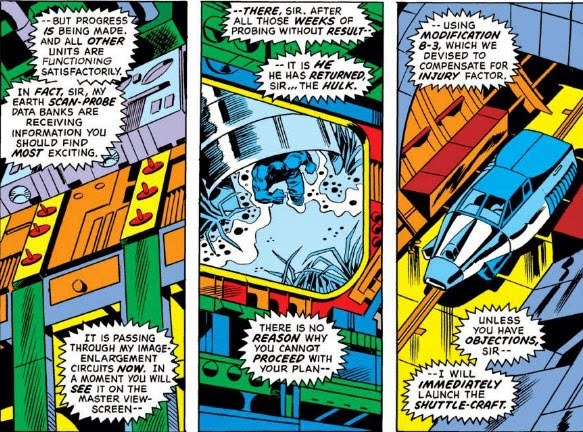 The computer didn't have a personality, as we understand it; rather, it was simply performing optimally in order to ensure that Deathlok survived. Or to administer bone-breaking punishment to a rash ally. According to ground stations not long afterward, there could be heard upbeat selections of Mozart coming over satellite frequencies for some time. 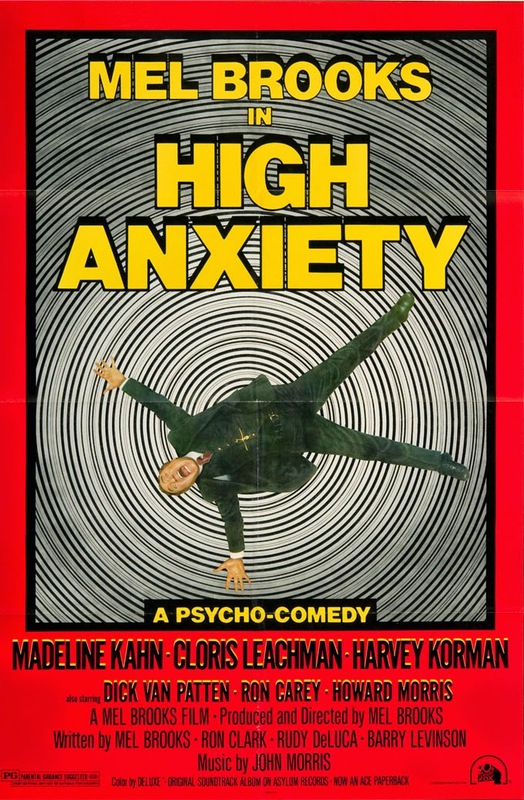 The Deadly Premiere of... well... The Birdnapper! 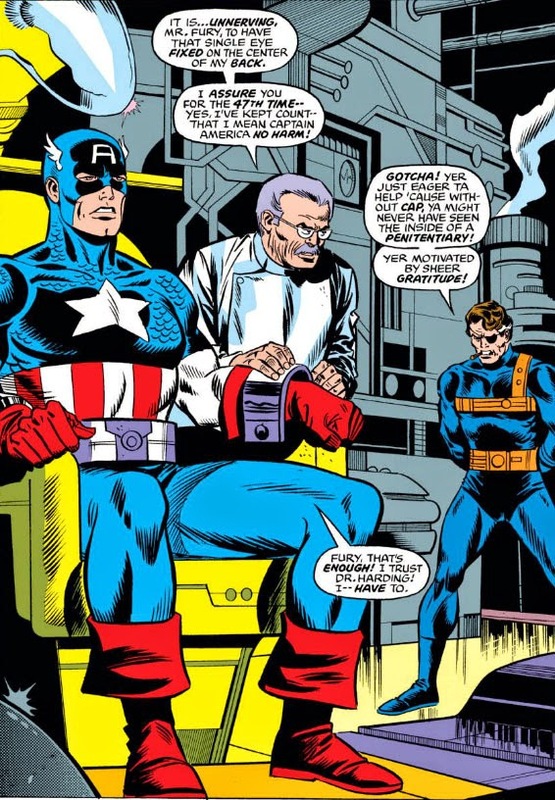 That question began a 10-issue arc in Captain America following writer/artist Jack Kirby's departure from the title, set in motion by Cap's realization that the years of his youth before he volunteered for the super-soldier experiment were suddenly years he no longer recalled. 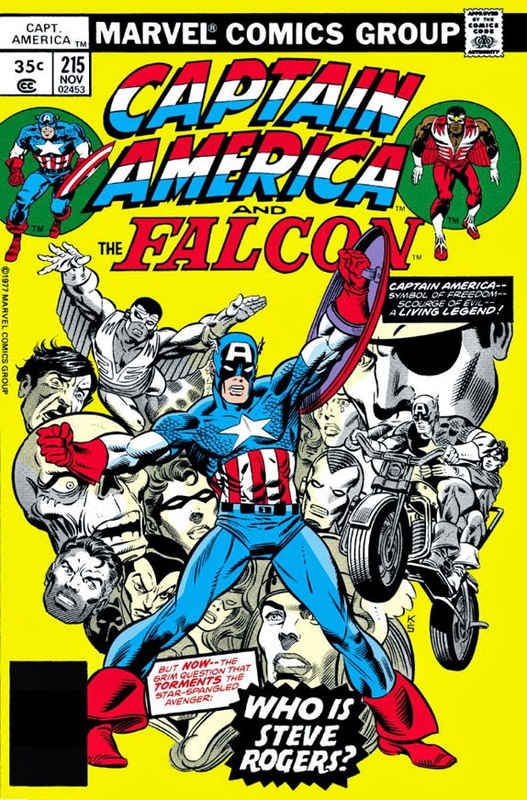 Roy Thomas began things by having Cap take himself back to his origin in that experiment. 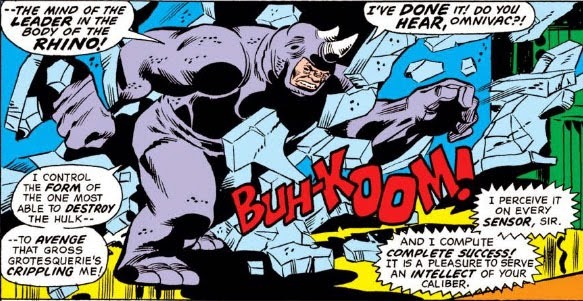 Then, following clues that led him to Newfoundland, Cap discovered a former Nazi enemy who partially restored his memory of the day he lost his partner, Bucky, while battling Zemo--a day he now knows didn't end with the fatal explosion of the drone plane and his plunge into the English Channel. 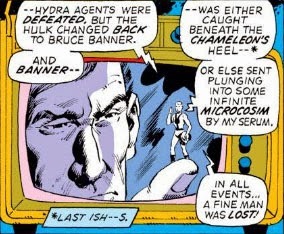 But after another three issues pass, this arc at last reaches its end, as Cap makes use of the scientific knowledge of Mason Harding (yes, that Mason Harding) to probe his memories more deeply and find the answers he seeks--under the watchful eye of Nick Fury, who isn't feeling too trustworthy toward the man who invented the "Madbomb." And so Cap's "full speed ahead" resolve begins the story of Steve Rogers, seen in Marvel history for the first time. The Pursuit And The Plight! 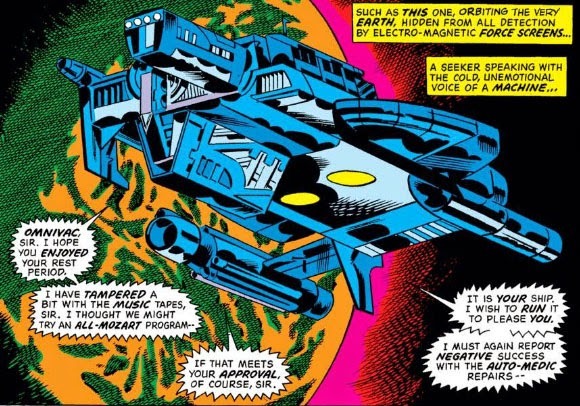 OR: "My Ship's Bigger Than Your Ship"
Understandably, the X-Men are now gunning for Deathbird--with the Earth only hours away from a Shi'ar deadline that demands that either Lilandra be recovered, or the Earth pays the price. 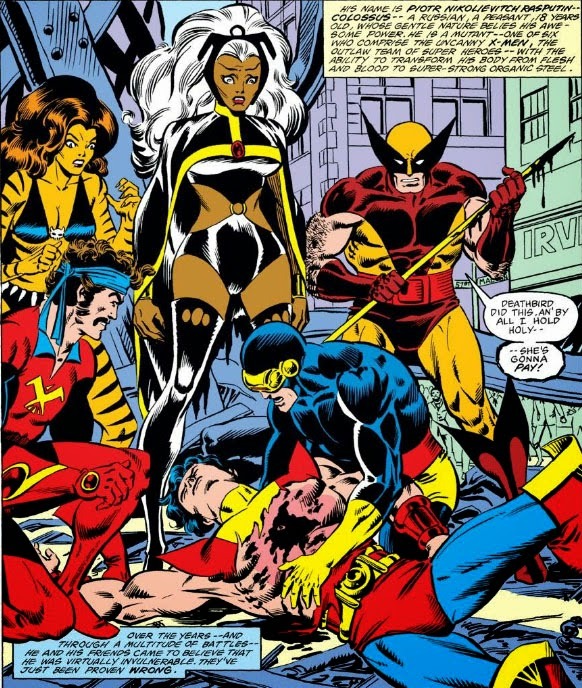 Given their setbacks thus far, will the X-Men be able to pull themselves together in time to avert disaster? 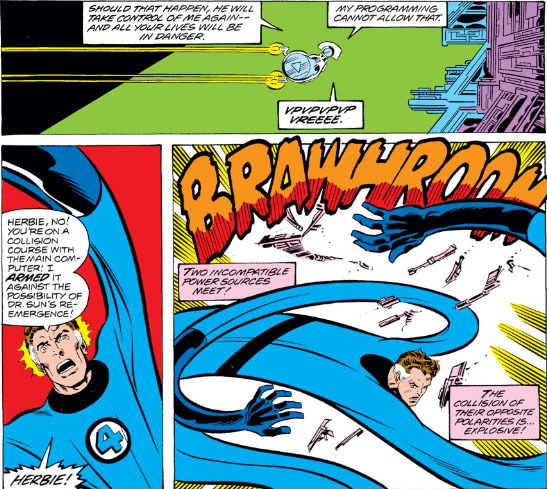 Have a look at another interesting side-by-side shot of a Fantastic Four cover and its counterpart in the reprint comic, Marvel's Greatest Comics--this time featuring FF #100! 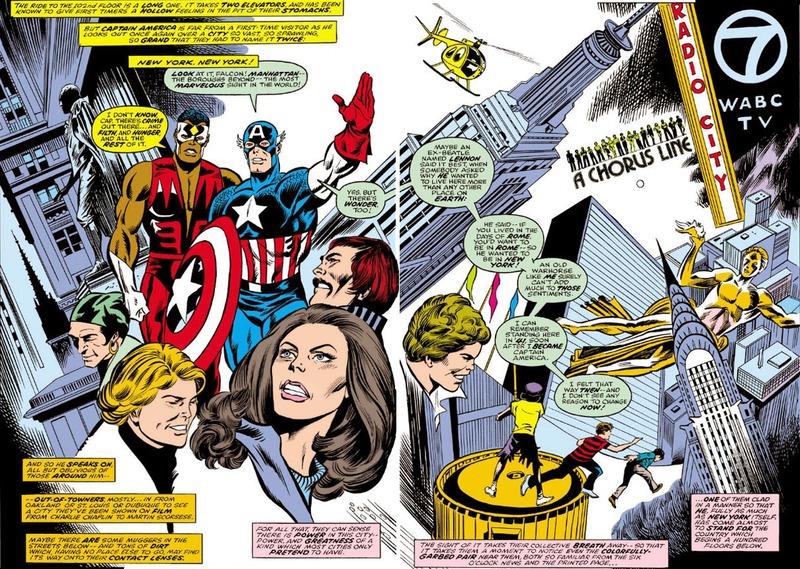 On the left, the original as drawn by Jack Kirby; on the right, the revised cover by Alan Kupperberg. 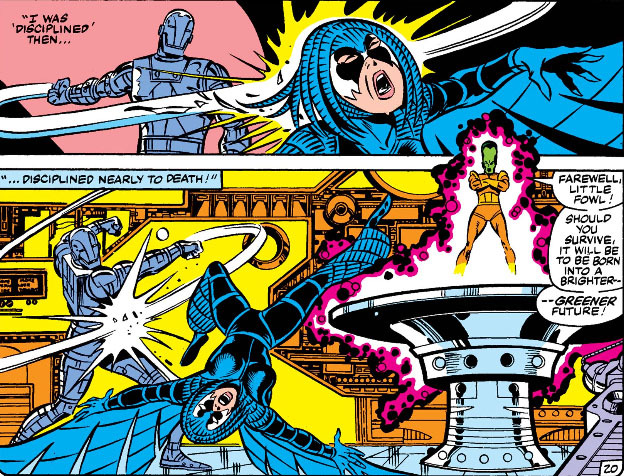 Both versions were inked by Joe Sinnott. 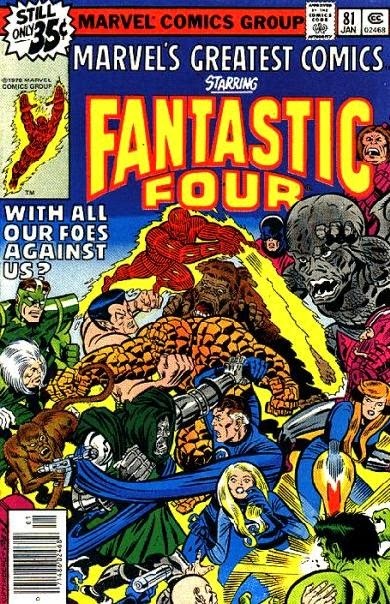 Back in the day, of course, Fantastic Four practically sold itself--but I thought Kirby's cover would have been better served by the vibrancy that Kupperberg, Sinnott and the colorist bring to the newer version. 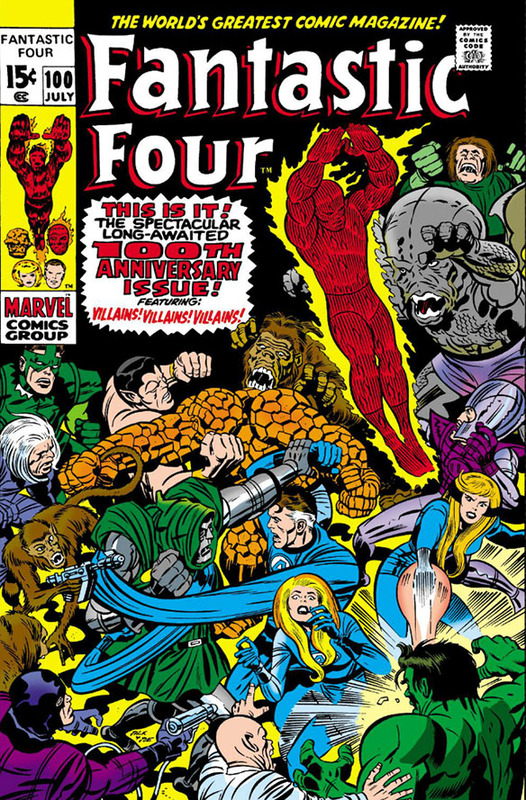 Facial expressions are more detailed (the Sub-Mariner, the Super-Apes, and Dragon Man are good examples), as is the rocky definition of the Thing--and the MGC cover features a variety of brighter colors in both the background and the FF logo, as opposed to the stark black-and-white of the original. The darker tone of the FF uniforms seems to work better, too, giving the team a less "faded" look. 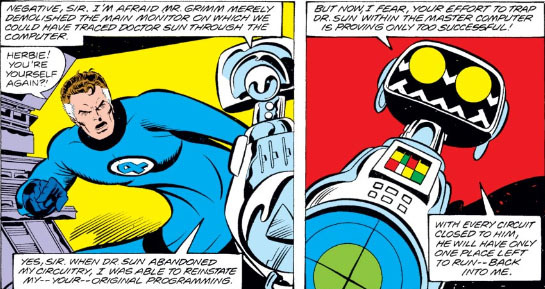 If it weren't for his paste gun, though, we wouldn't be able to make out the Trapster behind that darned UPC symbol. 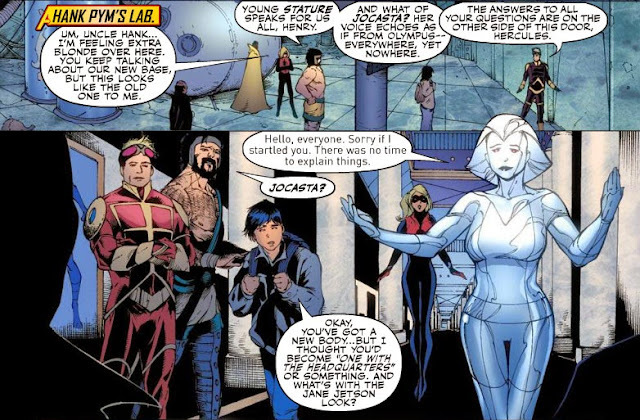 And there appears to be a new villain added to the mix, standing behind Dragon Man to his right--who is that guy? Kupperberg has also moved the Torch to accommodate the logo--but it looks like Johnny is about to cook his girlfriend! The Wizard seems to be saying "Thanks, Torch! I was sneaking up behind her, but I appreciate the help, fool!" REVEALED: The Secret Fate of Captain America! Previously, we've seen Captain America raise the question of his past life as Steve Rogers, the memories of which he'd discovered had been lost. And so he began an investigation into his own life, the life he led before he ever signed on for the super-soldier experiment where he became Cap. 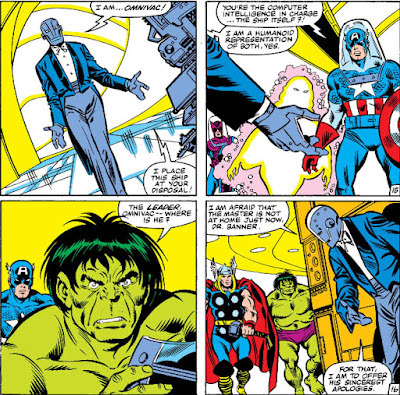 The story set in motion by Roy Thomas and Don Glut initially begins with a woman named Veda, a plant who belongs to the criminal organization known as the Corporation, who gives Cap a link to his past in order to become closer to him; but Cap instead pursues a lead that takes him to Newfoundland. Cap's decision is prompted by unanswered questions. If he plunged into the English Channel after the drone plane he and Bucky were trying to stop exploded, why did he tell the Avengers he struck the waters off of Newfoundland? 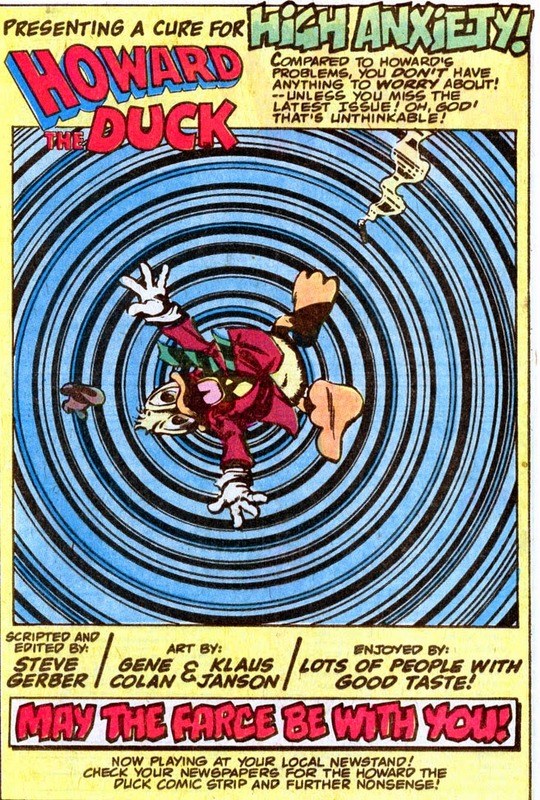 And what exactly put him into suspended animation? 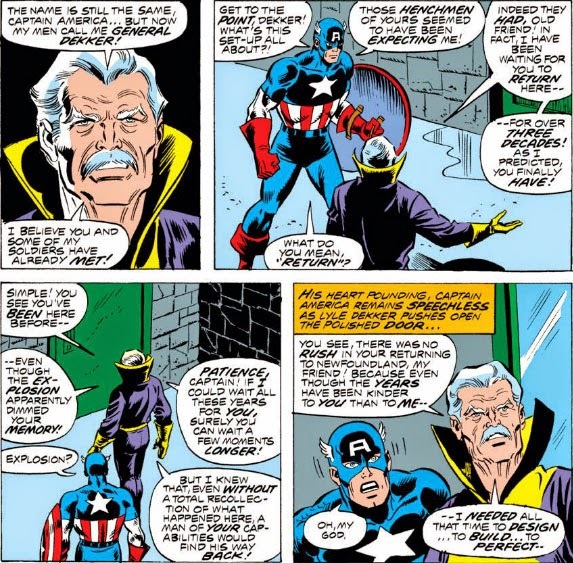 Glut has Stan Lee's oversight in writing Cap's explanation to the Avengers from his first appearance in Avengers #4 to thank for the inconsistency regarding the site of the explosion--and up until now, there was the assumption that his super-soldier serum prevented him from being frozen to death in the ice that presumably preserved him. To Cap, something obviously doesn't add up. 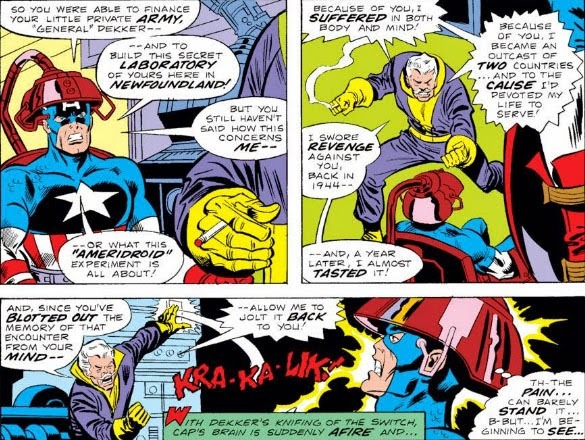 In Newfoundland, Cap uncovers a Nazi spy from 1944, Lyle Dekker, whose cover then had been to work for a movie studio where Cap and Bucky were investigating sabotage. 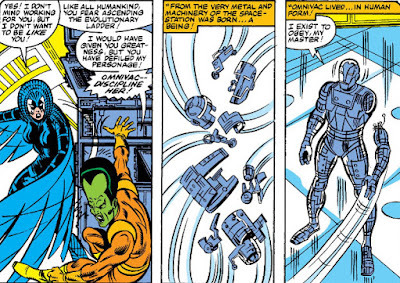 The pair's investigation led them to Dekker, who had invented a heat ray which would be delivered to the Red Skull. Dekker's plan was foiled, and he subsequently fell out of favor with the Skull--but, making a new beginning for himself in exile, Dekker would settle in Newfoundland and wait for the day when he would hopefully cross paths with Cap once again. If you decide to read this story in its entirety, you'll thank me later for skipping over the rampage of the "Ameridroid." 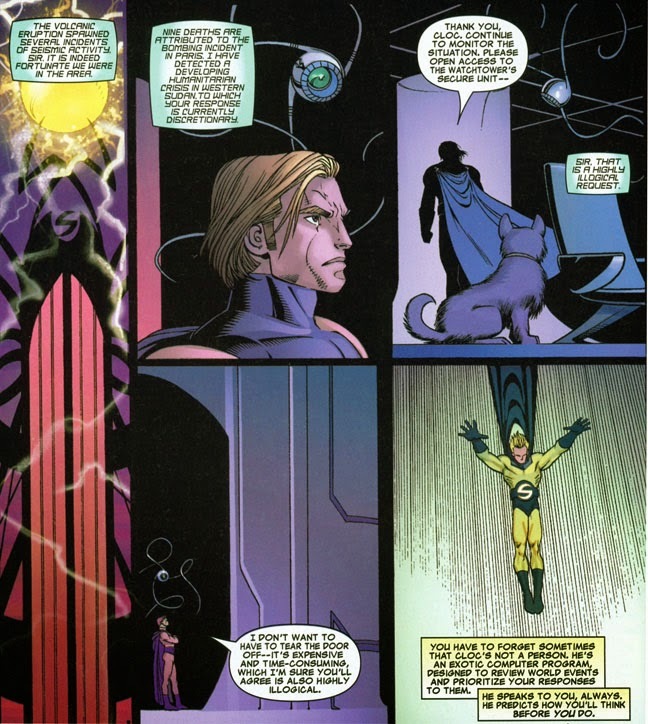 For now, it's Dekker's explanation to Cap regarding the gap in his memories which must hold our attention--because, by the time he's done, Captain America's encounter with Baron Zemo, which led to his being out of action for twenty years, will no longer have ended the way you thought it did. Who Lived Before The Legend? If you're looking for something a little more interesting in a Captain America origin, you might want to give Captain America #215 a whirl. While you'd be correct in assuming that another retelling of Cap's origin wasn't likely to yield anything new, it's really how writer Roy Thomas uses the origin to set in motion a new storyline for Cap that makes this story a little different than the others. 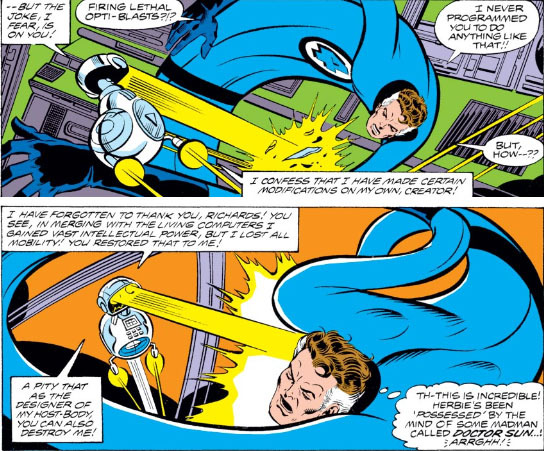 With Jack Kirby's departure from the book in late 1977 (shortly before his exit from Marvel Comics itself), Thomas had the somewhat thankless task of picking up the pieces of the Captain America title from where Kirby left it. 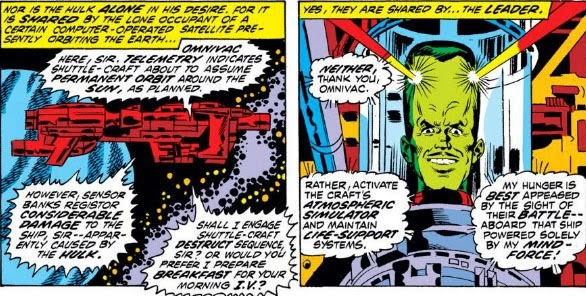 From appearances, the situation was in disarray, with Thomas seeming to have been given little lead time for crafting "a new direction" (as the final banner of the Kirby-written story put it) for the character and the book. 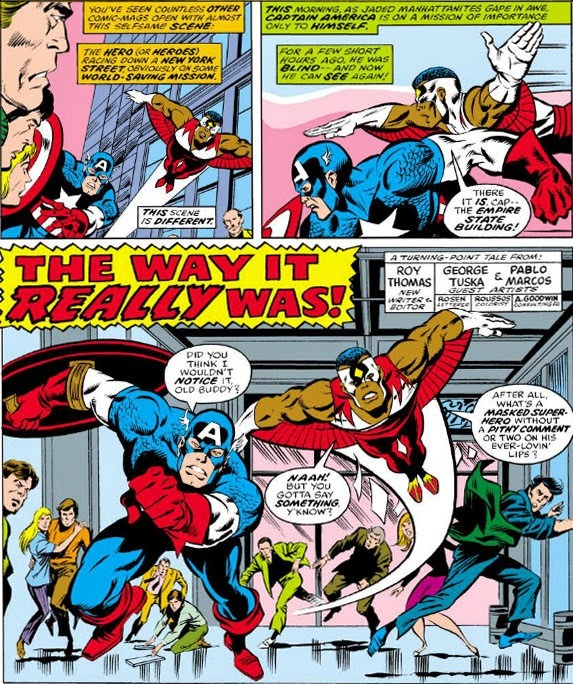 Instead of a full-fledged story seamlessly transitioning from Kirby's, another version of Cap's origin is plugged into the following issue, with artist George Tuska providing new work for it--and in the issue after that, a reprint from Strange Tales #114 of the Human Torch's battle with a Captain America impersonator. 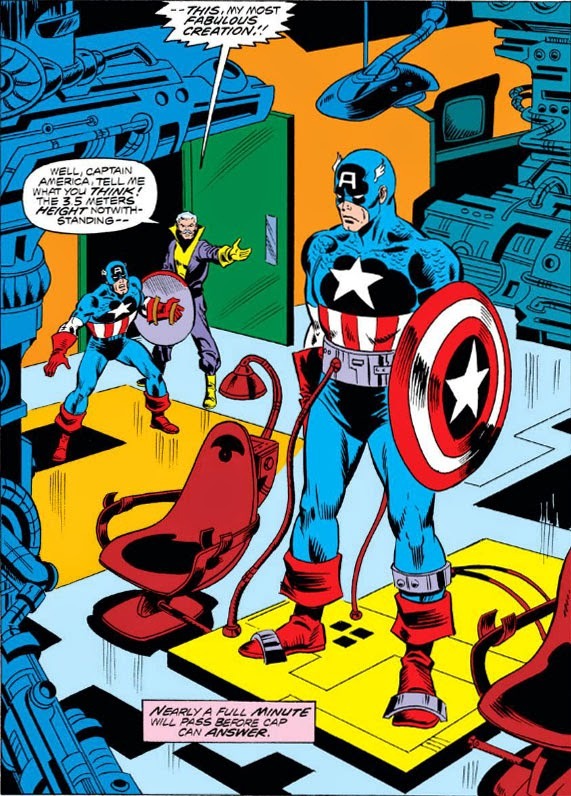 Both issues written in a style that would preface the new material and open the door to the story that would now be focused on: Cap's search for his past as Steve Rogers. 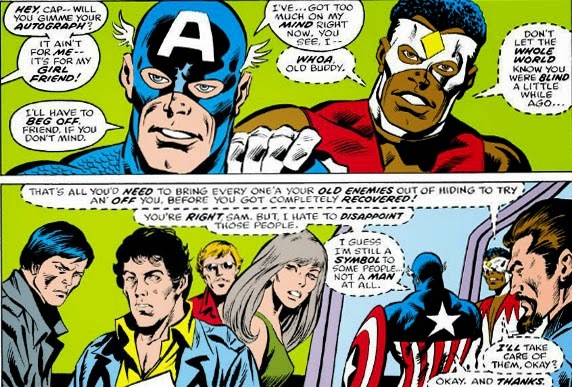 The dialog here and at the end would be the only references that we would see to Kirby's prior story--but it's Steve Rogers' thoughts of his childhood which would now veer us in that new direction. The question is: why do such thoughts begin with the origin of Captain America? The Major Who Wouldn't Die! We've followed the career of Major Glenn Talbot from when he first arrived as the new security chief under General Ross's command, and watched as he progressed in his career while being instrumental in discovering the true identity of the incredible Hulk. And through it all, he made an effort to grow closer to the General's daughter, Betty, even though she remained in love with Bruce Banner. 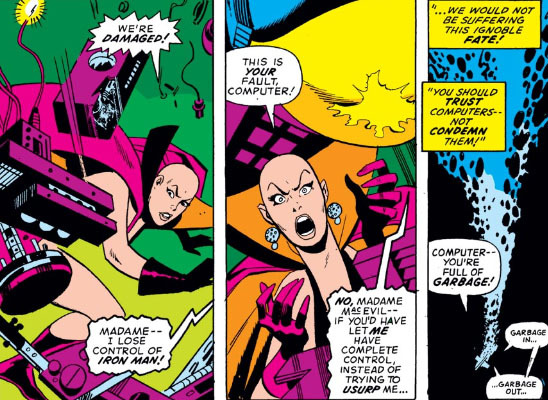 Talbot has been practically in Betty's orbit throughout her experiences with both Banner and the Hulk, seemingly to no avail. He was the textbook example of unrequited love--with Betty at times giving the impression that she was responding to Talbot's affections, but ultimately continuing to hope that Banner would one day be free of his curse as the Hulk so that they could finally be together. In short: Talbot had it bad for this gal, but never stood much of a chance while Banner continued to come between them, even mostly in absentia. 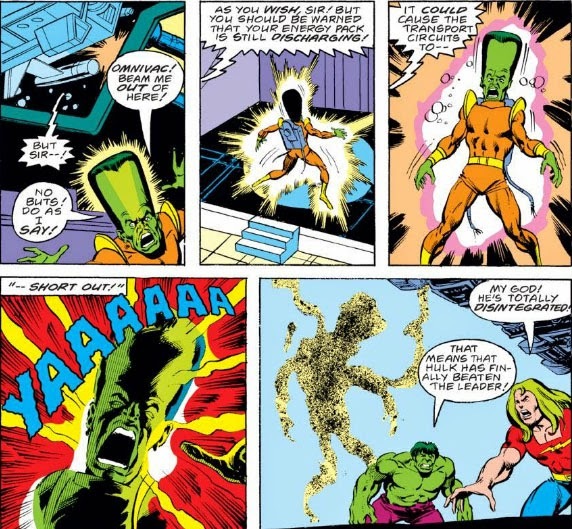 This isn't the first time Banner has been mistaken for dead, of course--but, in an odd turn of events, Betty now accepts the news with finality and gives Talbot the green light. And, before you know it (really--just one issue later! 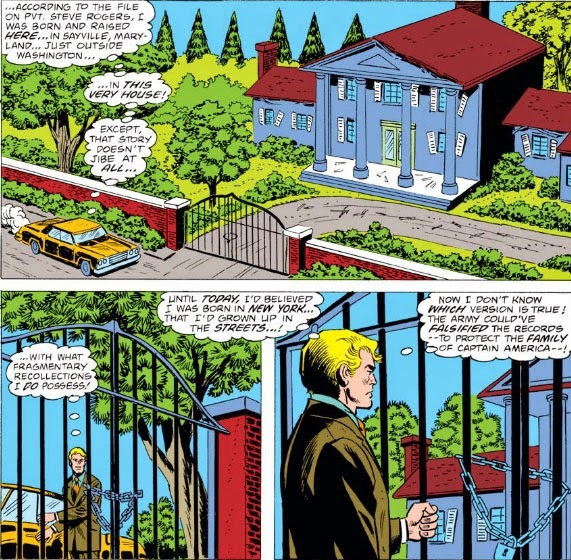 ), we find the two of them at a resort, with Talbot moving in for the kill and Betty all but responding with "Bruce who??" Betty is probably referring to Banner's growing affection for Jarella, the woman he met during a prior sub-atomic experience and whom he'd recently reconnected with. 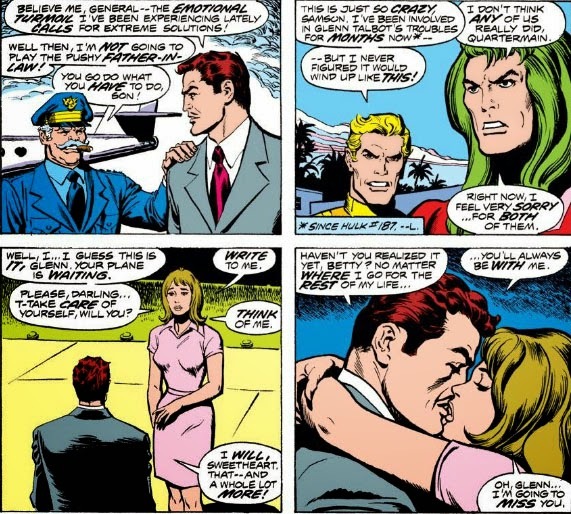 Jarella had the good fortune to establish a relationship with both Banner and the Hulk, though she was literally worlds apart from them--and so Banner enjoyed a unique relationship with her, something he'd also tried to have with Betty during the period he could control his transformations but which ended in disaster. 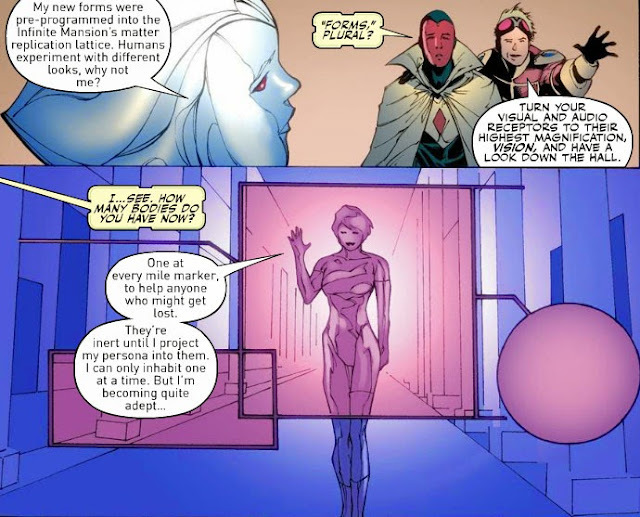 And so, while it may seem that Betty is writing off Banner rather quickly this time, in a way Jarella had made it possible for her to (as she says) see a future for herself without him. And as we've seen, Talbot was right there for the hand-off. So are congratulations finally in order for Major Talbot? Is this where the guy finally gets the girl? Well, yes and no. How dead do you think the Hulk is? The High-Maintenance Fury of--Veronica Vogue! At World's End Waits--The Maestro!